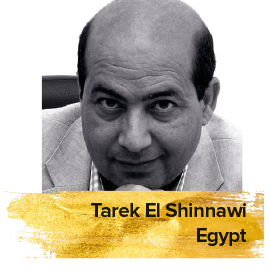 An internationally recognised film critic, writer and professor, Tarek El Shennawi is one of the most influential film critics in the Arab world. He holds a BA in Media from Cairo University and a bachelor’s degree from the Film Institute. El Shennawi’s writing has been appearing in top Arabic newspapers, magazines and websites for more than 30 years. He has also published 15 books on various aspects of Arab cinema. He has served on numerous film festival juries including those of the Muscat International Film Festival, Dubai International Film Festival, Abu Dhabi Film Festival and Osian's-Cinefan Film Festival in India.